One of the items on my wish list this Fall is a military-inspired jacket. I have a similar one (wore here) but the color is very drab. When ASOS reached out to introduce their petites collection, this jacket immediately caught my attention. My first impression of this jacket was of course the color. It has a true olive almost like forest green color - which is exactly what I am looking for. I am wearing a size UK 4 (US 1) and it fits just the way I would like. The measurement is 15 inches from shoulder to shoulder. For a jacket, the shoulder is the most important part. If the shoulder fits correctly, the rest of the jacket can be easily adjusted to fit your body shape better. For this type of jacket, I actually prefer a loose fit. A size 4 fits me great in the shoulders and the length. A bit baggy and loose in the body. Another thing I love about this jacket is that it has 2 large pockets in front. It’s so convenient for my morning runs when I only need to carry my phone and a key. The arms are big enough to accommodate a thick sweater and still be comfortable. The jacket comes with a removable belt. It has a heavy metal buckle which I can do without. I smash that buckle into my door every time I am getting in/out the car. A temporary solution is tucking the buckle into the front pocket. I will have to replace it with something else later on. The jacket also comes with a detachable hood which is a bonus. Even though the jacket is not lined, it seems much warmer since it’s made of 100% thick cotton. You look so beautiful! I love the dress and this jacket is just perfect! I love the print of this outfit, it is pretty amazing. Love the jacket! I love that it's baggy- I just want to steal your gold plate belt and cinch up the army jacket! That belt is officially on my must-have list! I like the large pockets in the front too. Good for mommy-wear. Adorable style. By the way, I made a mention to your blog in one of my latest posts: Fashion Blogger and Mom - How to Juggle Both? Thanks for all your inspiration in the past few years. 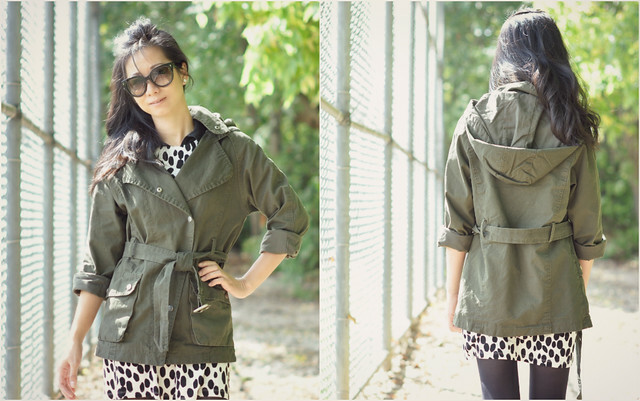 Lovely parka, your dress is very pretty! Great mix of tough & femme.....that parka is the great tough touch to that uber lovely dress!!! Love this look, Sydney! I've really been into military inspired jackets as well (this whole year actually!) and I know exactly what you mean by finding that "perfect olive" color. I feel like there are so many jackets out there that have more of a washed-out green color that almost seems like it's been in the washing machine too many times hehe :) I like that this jacket has more of a "relaxed" fit too so it could be dressed up or down in different occasions. It's so great that you paired it with the printed dress to add that pop of fun! <3 All in all, I'm a huge fan! Have a great rest of the week!! great post! I hope to see you in my blog sometimes. thanks!